Since we looked at the ways the thumb is able to move in the last post, I thought that now is a good time to take a look at how to draw the thumb. Today, we will look at the hand in basic shapes and forms to learn a simple way to connect the thumb to the body of the hand. First, we can gain a better sense of the hand and thumb by simplifying their forms into basic shapes. Here, I simplified the palm of the hand into a rectangle and the base of the thumb into a triangle. The triangle shape best describes the shape of the connection between the palm and the thumb. As shown in the illustration to the right, this triangle starts at the base to the rectangle and establishes the position of the thumb. In the image above we can see the forms of the hand simplified into two dimensional information. To better understand the hand we need to convert those basic shapes into three dimensional forms. To the right you can see that the rectangle has been converted into a box. The box adds width to the hand, and one needs to be careful to keep the thickness of the box accurate to the thickness of the hand. The triangle has been converted into three dimensional form. Here the thickness or the width of this form matches the thickness of the box used to illustrate the body of the hand. Now we can add the rest of the thumb. Here it is illustrated by a simple box, mimicking the length and width of a thumb. 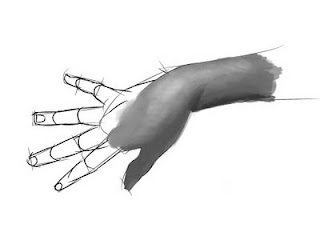 With these basic forms in mind, let's try drawing the thumb with the hand in a more complex position. Usually, one should start with the arm before starting to draw the hand. Since we are focusing on just the hand so we are going to start with the body of the hand. We want to interpret the body into the simplified box that we used above to illustrate the hand. We use this box to work out the basic size and position of the hand. In our reference the palm is facing down and we see the hand from the side. We should position the box so that the wide face of the box is facing down. Now to add the base of the thumb. We use the same triangular form that we used to create the base of the thumb in the example above. In drawing this form, we position it at the back end of the side of the box to establish the location. We should position the triangular form to point in the same direction that our thumb in the reference is pointing. The rest of the steps are the same steps as above. Interpret forms of the rest of the thumb into basic shapes and forms. Here we can divide the remaining forms of the thumb into two more parts, the middle and the tip. The middle portion of the thumb is described in this illustration as a small rectangular box. Finally, we can add the tip of the thumb. We can draw the last portion of the thumb as a box. Here, I tapered the end of the box to reflect the taper of the thumb. We don't have to do this as we are really are focusing of placing everything. We will refine the shape later. That is how we can find the connection of the thumb to the hand. Simplifying the forms into more easily defined shapes allow us to examine the relationship between the two. After we build these basic forms we can begin drawing the contour and looking at the shapes created by the anatomy of the hand. Here is the rest of the hand drawn in simple forms. Try drawing some hands in this way to help build a better understanding of the structures.